CNRS | CANA-CNRS: "For the Lebanese Sea"
CANA-CNRS: "For the Lebanese Sea"
This 6 Minute Extract of the CANA Documentary “For the Lebanese Sea” is a unique visual opportunity to delve into the daily work of the CANA-CNRS Research Vessel (R/V), while also framing the achievements of the projects within the broader context of collaborations and partnerships. 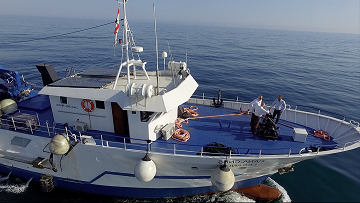 A donation of the Italian Government in 2009; CANA-CNRS R/V helps further enhance research capacity, while providing an innovative and unique tool for the sustainable development of the Lebanese Coastal Eco-System. Through continued collaborations with esteemed donors and institutions (AICS، EU, CHEAM/IAM-Bari, HFF، FAO ...) and an active and dedicated team of researchers working on Bathymetric Mapping of the Sea Floor, Geo-Archeological Surveying, Submerged Fresh Water Studies, Pollution Monitoring, Biodiversity and Cetacean Observations, Fish Stock Assessment, Public Awareness and much more… the Research Vessel represents collaboration that we are deeply proud of and that has made CANA a Label for Marine Research in Lebanon. In the first quarter of 2019; CANA-CNRS will celebrate 10 years since the inauguration and start of its marine research activities in Lebanon. وتجدر الإشارة إلى أن المجلس الوطني للبحوث العلمية يحتفل في الربع الأول من العام 2019 بمرور 10 سنوات على إطلاق البحوث البحرية بواسطة المركب قانا.